Former France striker Nicolas Anelka has joined Atletico Mineiro, according to the Brazilian side's president. 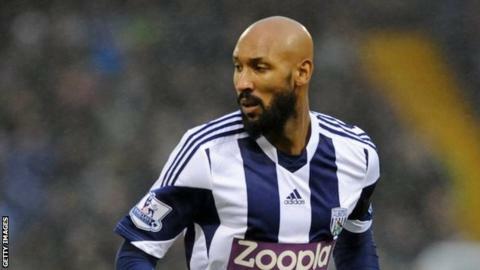 Anelka, 35, has been without a club since being sacked by West Brom last month after making a 'quenelle' gesture when celebrating a goal. Atletico president Alexandre Kalil tweeted: "Anelka e do Galo", which translates as "Anelka is a rooster", in reference to the club's nickname. But the Copa Libertadores champions have yet to confirm the signing. The Frenchman was banned for five games and fined £80,000 by the Football Association's independent regulatory commission for making the sign - described as "an inverted Nazi salute" - after scoring in a 3-3 draw with West Ham in December. The club subsequently sacked him for both his conduct that day and a social-media outburst where he wrote on Twitter that he was leaving with "immediate effect" after failing to reconcile differences with the club over his gesture. Anelka denied his use of the sign was intended to be anti-Semitic, and the commission reported it did not find he was "an anti-Semite". However, Anelka claims he made the gesture in support of his friend Dieudonne M'bala M'bala, a French comedian who has been convicted seven times of anti-Semitic crimes. Atletico Mineiro will be Anelka's 12th club in an 18-year career and are based in Belo Horizonte, where England will play Costa Rica in their Group D match at the World Cup on 24 June. The club won the Brazilian championship in 1971 and have been runners-up on four occasions. Last year they beat Paraguayan side Olimpia of Asuncion in the final of the Copa Libertadores, the South American equivalent of the Champions League.